Time seems to fly by so fast — the Thanksgiving Holiday is upon us. Many of the families served by the Jubilee Center of South Broward were among those adversely affected by Hurricane Irma and more than ever need your assistance. As they have for many years, the Jubilee Center is doing its Thanksgiving Basket project, specifically for homeless families with children. 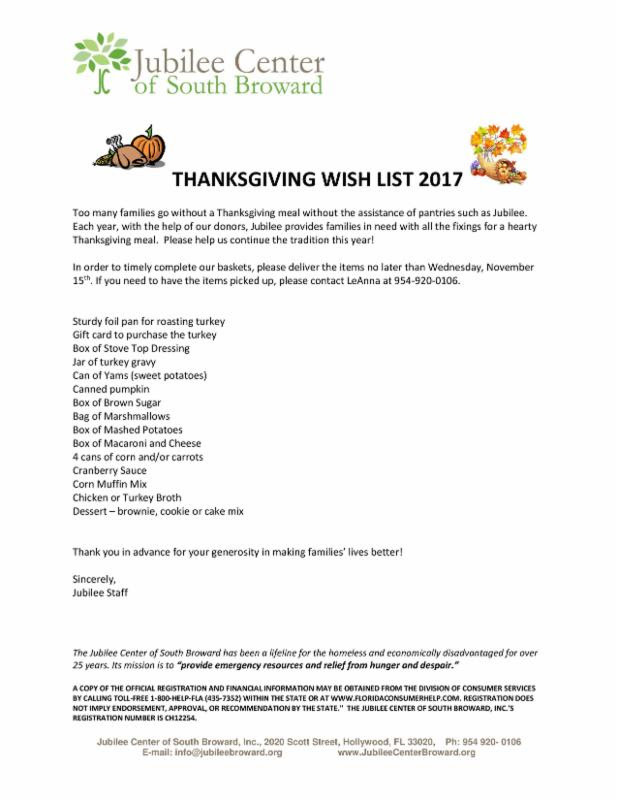 They have provided the below list of needed items and are requesting delivery by November 15th so that the baskets can be distributed on the 21st, in time for Thanksgiving. This is where you come in. Please look over the below wish list of items needed and decide what you are capable of giving. Please do not wrap your basket in case there are additional items for each basket. The Jubilee Center is located at 2020 Scott St., Hollywood, FL 33020. If you need to have your items picked up or would be available for volunteering to assemble the baskets, please call LeAnna at 954-920-0106.